Are Salon and Spa Treatments Worth It? Nothing has us running for the hills more than the idea of doing a skin care treatment like a bikini wax at home -- cue horror movie soundtrack. There are some things you can do safely and easily at home, but then there are certainly hair care and skin care treatments that should be left to trusted professionals. Case in point: Loving the trendy lob (aka long bob) is one thing, but deciding to do it yourself by plopping a fruit bowl on your head (visions of the Jack in the Box commercials are running through our minds) is definitely not recommended, and will most likely demand a trip to the hair salon afterwards anyway. So leave the scissors to the pros by going in for a haircut. On the other hand, something like a deep conditioning treatment you can do at home by simply using your fave conditioner and a shower cap. Doing this once a week will help maintain shiny, healthy hair. You don't have to skip spa trips or settle for uneven highlights because we picked the brains of skin care experts, Olga Lorecin-Northup of Kinara Spa in West Hollywood, Calif. and Annet King, Director of Training and Development for The International Dermal Institute, as well as Whitney Olson, a hairstylist at the Warren-Tricomi salon in Los Angeles and celebrity hairstylist Jessica Tingley -- they revealed which hair and skin care treatments are worth splurging on, and which skin care and hair services you can do at home, yielding pretty much the same results. DIY is great stuff!! I swear by Grape seed oil and extract!! These are all great tips. A massage by a professional sounds like heaven. Useful information on what do get done professionally and what to DIY. I much prefer to do most of my beauty treatments at home, but there are a choice number of things that should be left to the professionals. GREAT ADVICE... MY HAIR IS EXTREMLY DRY. MY SKIN IS DRY EXCEPT MY FACE, IT'S COMBINATION GOING THROUGH MENOPAUSE. GREATTTTTTTT INFO. I COULD USE ALL THE ADVICE i CAN GET. YOU PEOPLE ARE AWESOME. Highly informative. Sometimes you get what you pay for, and sometimes you truly don't. If you find a good spa or treatment expert, do not let them fall to the wayside. Self proclaimed experts are a dime a dozen. Actually, this is a great way to get a deep conditioning treatment for your hair without spending a fortune. I wouldn't use lots of my regular conditioner though. Spending a few extra dollars on a quality deep conditioner is worth it to use maybe once a week. The shower cap traps in the heat from your head and therefore is able to penetrate the hair folicles better. I have dual processed hair, so it can get feeling pretty dry and brittle if I don't keep up with the deep conditioner. If you don't have a shower cap, just go to the kitchen and grab some saran wrap. Use a couple large pieces of saran/plastic wrap to cover your head and then put a towel wrap on top. 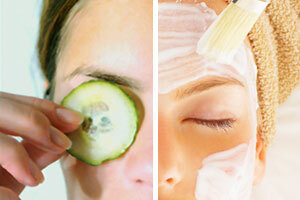 These are some really great alternatives to the expensive spa treatments.